This handy Kokoba plastic bowl is perfect for giving your pet food, water and afternoon snacks. The Kokoba plastic bowl is a real essential. 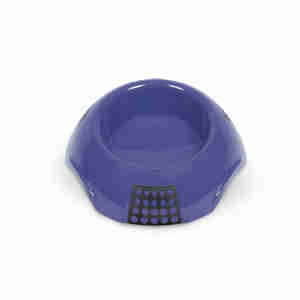 The simple design is classic and perfect for giving your pet food or water. If you decide to use it for water, remember to keep it topped up. If your little buddy doesn't have constant access to water, they could get dehydrated. It's also important to make sure it's fresh, so that your pooch or kitty doesn't end up with a tummy bug. It's best to change the water twice a day to stop germs sticking around, and wash the bowl in hot soapy water once a day. It should be clean enough that you could drink out of it yourself, if you had to. You should also wash the bowl once a day if you're using it for food. Adult dogs and cats should be fed twice a day, although different animals do have different appetites. Experts don't recommend leaving food out all day for your pets to munch on when they feel like it. Most dogs and cats love routine, so you should try to feed them at the same time every day. If they don't eat dinner within 20 minutes, throw it out. plastic is durable, high quality and non-toxic. Fill this tough round bowl with food or water so that your pet doesn't go hungry. It has non-slip rubber on the bottom, so if you put it on a smooth surface it won't skid around (even if your four-legged friend's a really excited eater). It's made from smooth plastic so it's really easy to keep it clean, and the plastic is hard-wearing and non-toxic too. This is a brilliant bowl as it doesn’t slide when Molly eats from it on our wooden floor. Excellent quality bowl - non slip. I bought a small - good size - equally suitable for dog food and water. Don't ask yourself will it be big enough. YES IT WILL BE. Have two dogs, one who slurps and spills and empties the bowls quickly. Still makes mess but plenty water left after drink. Sturdy well made build. The only problem is having a steady walk across kitchen myself to place it down without spilling, so I don't quite fill it. Admit the large bowl would probably have been a good choice. If you use it as a food bowl I reckon it would keep a Great Dane/Mastiff quite happy at this size.